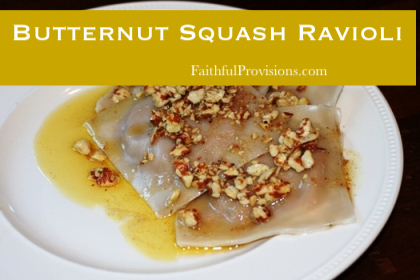 This Butternut Squash Ravioli recipe is a variation of my Pumpkin Ravioli recipe that I like to make. When butternut squash is in season, I am always on the lookout for recipes that offer me a new way to use this delicious squash. 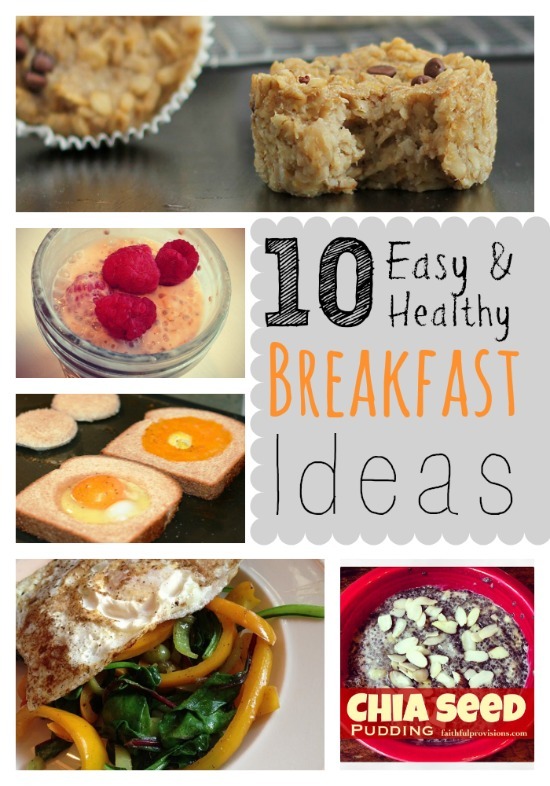 One thing I have found is that you can substitute butternut squash in many pumpkin recipes. This Butternut Squash Ravioli is definitely one that works if you want to do that. You’ll need 2 cups of butternut squash for this Butternut Squash Ravioli. Preparing the butternut squash is easy. For this dish, I just cut it into cubes, toss with olive oil, salt, and pepper, and then roast it on 400 degrees for about 20-25 minutes. To streamline the process, I will do this while I’m already in the kitchen making lunch. Then I will allow it to sit out on the counter so that it will cool thoroughly that afternoon. When I’m ready to make the ravioli filling, I drop it into a food processor or blender (or you can just mash it). Alternate filling: Try my Butternut Squash Soup Base as the ravioli filling! It has a slightly different flavor. You’ll find this recipe makes a lot if you have small children. We were able to get a generous two meals out of it, one of which I put in the freezer to enjoy another time. 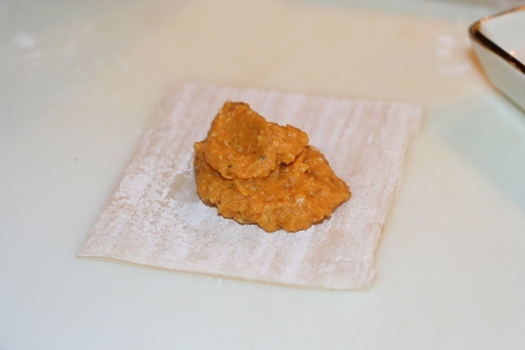 You may wrap these, getting 2 wraps per ravioli (large square), or you might just double one over (triangle). You’ll either get 20 large or 40 small raviolis, depending on the method you choose. The sauce recipe for Butternut Squash Ravioli is included below. It’s a simple butter sauce, but I do want to encourage you to take your time with it and watch it closely because it can easily burn. You’ll find step by step picture instructions beneath the recipe. In a medium saucepan cook onion and garlic in 1 teaspoon butter on medium heat, around 3 minutes, until onion is cooked. Don’t burn! 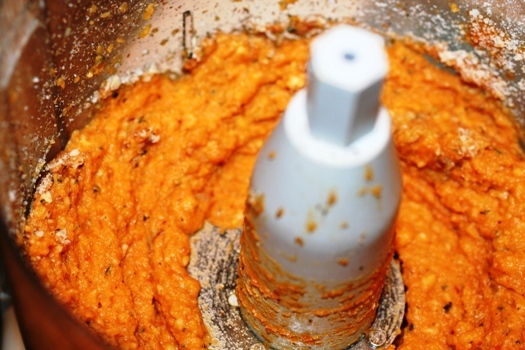 In a food processor combine ¼ cup walnuts and rosemary. Cover and pulse until nuts are finely ground. Add butternut squash, ¼ cup cheese, onion, garlic, salt, and pepper. Cover and pulse until combined. Lay wonton wrappers out on workspace, have a small dish of water to dip your fingers in to wet wonton so it will seal. Top one with approximately one tablespoon of the butternut squash mixture. Brush the edges of the wrapper with water and lay the second wrapper on top, seal edges. Continue until you use all the filling. *Tip: If mixture comes out because you used too much, just squeeze it out until wrapper will close. Boil a pot of water and cook ravioli for about 2 to 3 minutes. Keep it at a low boil. Drain ravioli. Place on a dish and drizzle with walnut butter topping below. Coarsely chop remaining walnuts, then heat remaining ¼ cup butter and add walnuts. Stir until butter begins to brown. Keep it on low, you don’t want to burn the butter, just have it turn brown. Remove from heat and keep warm. This is your sauce for the Butternut Squash ravioli! In a food processor combine 1/4 cup walnuts (or pecans) and rosemary. Cover and pulse until nuts are finely ground. Add butternut squash, 1/4 cup cheese, onion, garlic, salt and pepper. Cover and pulse until combined. Lay wonton wrappers out on workspace. Have a small dish of water to dip your fingers in to wet wonton so it will seal. 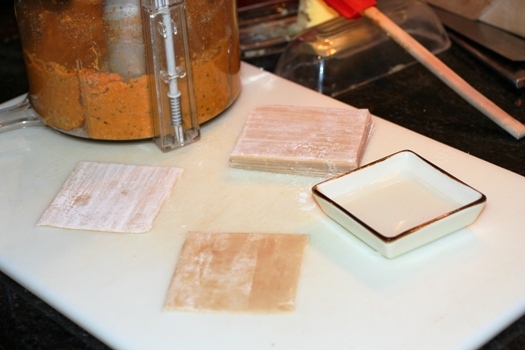 Lay out two wrappers, and top one with approximately one tablespoon of the butternut squash mixture. Brush the edges of the wrapper with water and lay the second wrapper on top, seal edges. 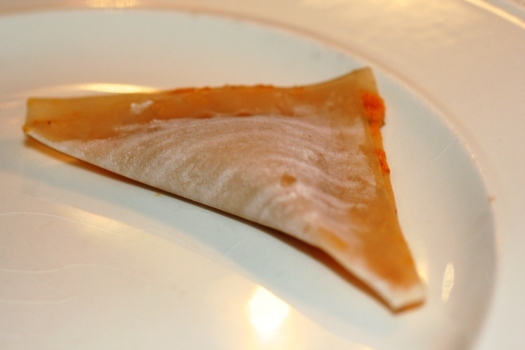 Or, to make smaller raviolis, use less filling and just fold over the wrapper so that it makes a triangle shape, as seen in picture above. Seal edges. Continue until you use all the filling. *Tip: If mixture comes out because you used too much, just squeeze it out until wrapper will close. Learn several methods (including my favorite–roasting!) for cooking butternut squash HERE.